Athens, ca. 393 to 300 BC. Silver Tritartamorion. RARE TYPE. 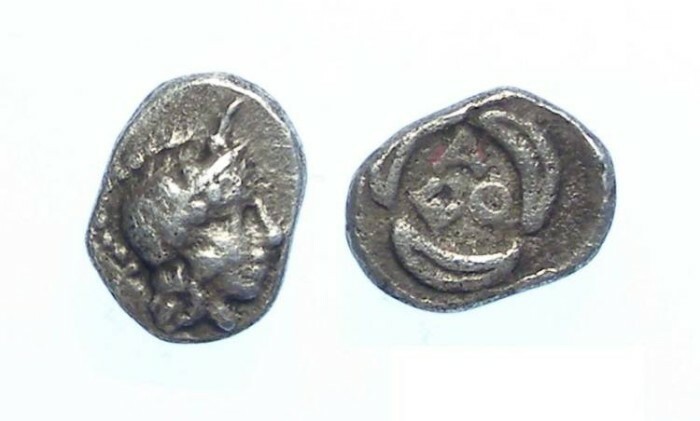 Date : This coin has the forward facing eye, associated with the period of 393 to 300 BC. Size : 6.8 x 8.4 mm. Weight : 0.31 grams. THIS IS A SMALL COIN. Grade : gVF for wear, some porosity that looks far worse on the image than it does on the actual coin. Over all the coin is significantly nicer than the image suggest. Rarity and value : This type is seldom offered for sale, and is one of the most difficult to find by anyone building a Athens denomination type set. The last example I have found a price record for was sold on the LHS Numismatik AG auction 102 lot 192 on 28 April 2009 in similar quality for 1100 Swiss Franks plus the buyers premium which at the time would have worked out to about $1250 US funds. Reverse : AQE with three olive leaves around.